This article is about the Germanic tribes. For the subculture, see Goth subculture. For other uses, see Gothic. Gothic soldiers on the Missorium of Theodosius I, made in 388 AD. 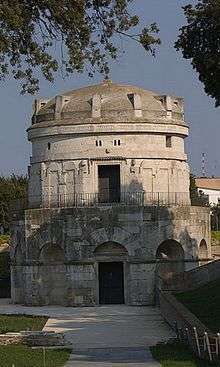 The Mausoleum of the Gothic monarch Theodoric the Great, in Ravenna, Italy. 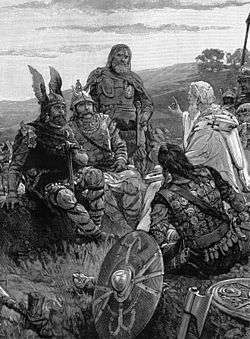 The Goths were an East Germanic people, two of whose branches, the Visigoths and the Ostrogoths, played an important role in the fall of the Western Roman Empire and the emergence of Medieval Europe. The Goths dominated a vast area, which at its peak under the Germanic king Ermanaric and his sub-king Athanaric possibly extended all the way from the Danube to the Don, and from the Black Sea to the Baltic Sea. The Goths spoke the Gothic language, one of the Eastern Germanic languages; all are now extinct and left no modern descendants. Götaland, south Sweden, with the island of Gotland in the east, a possible origin of the Goths. The southernmost and westernmost parts, Scania, Halland, Blekinge and Bohuslän, were originally not a part of Götaland, but were Dano-Norwegian territory until 1658. In the Gothic language they were called the Gut-þiuda, most commonly translated as "Gothic people", but only attested as dat. sg. Gut-þiudai, or Gutans Inferred from gen. pl.(?) gutani in Pietroassa inscription. In Old Norse they were known as the Gutar or Gotar, in Latin as the Gothi, and in Greek as the Γότθοι, Gótthoi. The Goths have been referred to by many names, perhaps at least in part because they comprised many separate ethnic groups, but also because in early accounts of Proto-Indo-European and later Germanic migrations in the Migration Period in general it was common practice to use various names to refer to the same group. The Goths believed (as most modern scholars do) that the various names all derived from a single prehistoric ethnonym that referred originally to a uniform culture that flourished around the middle of the first millennium BC, i.e. the original Goths. The exact origin of the ancient Goths is unknown. Evidence of them before they interacted with the Romans is limited. The traditional account of the Goths' early history, based on the writings of the Ostrogoth Jordanes, a 6th-century Roman bureaucrat and historian, was that the earliest migrating Goths sailed from what is now Sweden to what is now Poland, and replaced inhabitants there, forming the Wielbark culture. Modern academics have generally abandoned this theory. Today, the Wielbark culture is thought to have developed from earlier cultures in the same area. Archaeological finds show close contacts between southern Sweden and the Baltic coastal area on the continent, and further towards the south-east, evidenced by pottery, house types and graves. Rather than a massive migration, similarities in the material cultures may be products of long-term regular contacts. However, the archaeological record could indicate that while his work is thought to be unreliable, Jordanes' story was based on an oral tradition with some basis in fact. Upon their arrival on the Pontic Steppe, the Germanic tribes adopted the ways of the Eurasian nomads. The first Greek references to the Goths call them Scythians, since this area along the Black Sea historically had been occupied by an unrelated people of that name. The application of that designation to the Goths appears to be not ethnological but rather geographical and cultural, the latter in reference to the Greeks' considering both the ethnic Scythians and the Goths to be barbarians. The earliest known material culture associated with the Goths on the southern coast of the Baltic Sea is the Wielbark culture, centered on the modern region of Pomerania in northern Poland. This culture replaced the local Oxhöft or Oksywie culture in the 1st century, when a Scandinavian settlement was established in a buffer zone between the Oksywie culture and the Przeworsk culture. 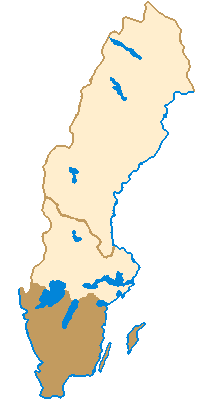 The culture of this area was influenced by southern Scandinavian culture beginning as early as the late Nordic Bronze Age and early Pre-Roman Iron Age (c. 1300 – c. 300 BC). In fact, the Scandinavian influence on Pomerania and today's northern Poland from c. 1300 BC (period III) and onwards was so considerable that some see the culture of the region as part of the Nordic Bronze Age culture. In Eastern Europe they formed part of the Chernyakhov culture. 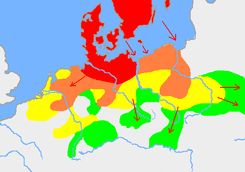 Around 160 AD, in Central Europe, the first movements of the Migration Period were occurring, as Germanic tribes began moving south-east from their ancestral lands at the mouth of River Vistula, putting pressure on the Germanic tribes from the north and east. As a result, in episodes of Gothic and Vandal warfare Germanic tribes (Rugii, Goths, Gepids, Vandals, Burgundians, and others) crossed either the lower Danube or the Black Sea, and led to the Marcomannic Wars, which resulted in widespread destruction and the first invasion of what is now Italy in the Roman Empire period. It has been suggested that the Goths maintained contact with southern Sweden during their migration. The first seaborne raids took place in three subsequent years, probably 255-257. An unsuccessful attack on Pityus was followed in the second year by another, which sacked by Pityus and Trabzon and ravaged large areas in the Pontus. In the third year, a much larger force devastated large areas of Bithynia and the Propontis, including the cities of Chalcedon, Nicomedia, Nicaea, Apamea Myrlea, Cius and Bursa. By the end of the raids, the Goths had seized control over Crimea and the Bosphorus and captured several cities on the Euxine coast, including Olbia and Tyras, which enabled them to engage in widespread naval activities. As the Goths increasingly became soldiers in the Roman armies in the 4th Century AD, contributing to the almost complete Germanization of the Roman Army by that time. The Gothic penchant for wearing skins became fashion in Constantinople, which was heavily denounced by conservatives. Following a famine the Gothic War of 376–382 ensued, where the Goths and some of the local Thracians rebelled. The Roman Emperor Valens was killed at the Battle of Adrianople in 378. 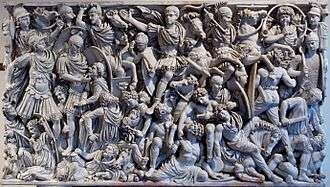 Following the decisive Gothic victory at Adrianople, Julius, the magister militum Eastern Roman Empire, organized a widescale massacre of Goths in Asia Minor, Syria and other parts of the Roman East. Fearing rebellion, Julian lured the Goths into the confines of urban streets from which they could not escape and massacred soldiers and civilians alike. As word spread among the Goths rioted throughout the region, and large numbers were killed. Survivors may have settled in Phrygia. Although the Huns successfully subdued many of the Goths, who joined their ranks, a group of Goths led by Fritigern fled across the Danube. Major sources for this period of Gothic history include Ammianus' Res gestae, which mentions Gothic involvement in the civil war between emperors Procopius and Valens of 365 and recounts the Gothic War (376-382). Around 375 AD the Huns overran the Alans and then the Goths. In the late fourth century: the Huns arrived from the east and invaded the region controlled by the Goths. The maximum extent of territories ruled by Theodoric the Great in 523. Both the Greuthungi and Thervingi became heavily Romanized during the 4th Century. This came about through trade with the Romans, as well as through Gothic membership of a military covenant, which was based in Byzantium and involved pledges of military assistance. Reportedly, 40,000 Goths were brought by Constantine to defend Constantinople in his later reign, and the Palace Guard was mostly composed of Germanic soldiers, as the quality and quantity of the native Romans troops kept declining. The Gothic missionary Wulfila devised the Gothic alphabet to translate the Wulfila Bible, had converted many of the Goths from Germanic paganism to Arian Christianity. The Goths remained divided – as Visigoths and Ostrogoths – during the 5th Century. These two tribes were among the Germanic peoples who clashed with the late Roman Empire during the Migration Period. A Visigothic force led by Alaric I sacked Rome in 410. Honorius granted the Visigoths Aquitania, where they defeated the Vandals and conquered most of the Iberian Peninsula by 475. The Huns fell upon the Thervingi, whose staunchly pagan ruler, Athanaric, sought refuge in the mountains. Meanwhile, the Arian Thervingian rebel chieftain Fritigern approached the Eastern Roman Emperor Valens in 376 with a portion of his people and asked to be allowed to settle with his people on the south bank of the Danube. Valens permitted this, and even assisted the Goths in their crossing of the river (probably at the fortress of Durostorum). In 410, the Visigoths' Sack of Rome (410) under Alaric I, defeated Attila at the Battle of the Catalaunian Plains under Theodoric I in 451, and founded in 418 a Visigothic Kingdom in Aquitaine. In 507, the Visigoths were pushed into Hispania by the Frankish Kingdom following the Battle of Vouillé in 507. By the late 6th century, the Visigoths had converted to Christianity. They were conquered in 711 when the Muslim Moors defeated Roderic during the Umayyad conquest of Hispania, but they founded the Kingdom of Asturias in 718 and began to regain control under the leadership of the Visigothic nobleman Pelagius of Asturias, whose victory at the Battle of Covadonga (ca. 722) began the centuries-long Reconquista. It was from the Asturian kingdom that modern Spain and Portugal evolved. These Goths became completely Hispanicized, retaining little of their original culture except for Germanic names still in use in present-day Spain. Christopher I. Beckwith suggests that the entire Hunnic thrust into Europe and the Roman Empire was an attempt to subdue independent Goths in the west. It is possible that the Hunnic attack came as a response to the Gothic eastwards expansion. Ermanaric committed suicide, and the Greuthungi fell under Hunnic dominance. In the 4th Century, the Greuthungian king Ermanaric became the most powerful Gothic ruler, coming to dominate a vast area of the Pontic Steppe which possibly stretched from the Baltic Sea to the Black Sea as far eastwards as the Ural Mountains. Ermanaric's dominance of the Volga-Don trade routes made historian Gottfried Schramm consider his realm as a forerunner of the Viking founded state of Kievan Rus'. Under Theodemir, the Ostrogoths broke away from Hunnic rule following the Battle of Nedao in 454, and decisively defeated the Huns again under Valamir at Bassianae in 468. At the request of emperor Zeno, Theodoric the Great conquered all of Italy from the Scirian Odoacer beginning in 488. The Goths were briefly reunited under one crown in the early 6th century under Theodoric the Great, who became regent of the Visigothic kingdom following the death of Alaric II at the Battle of Vouillé in 507. Procopius interpreted the name Visigoth as "western Goths" and the name Ostrogoth as "eastern Goth", reflecting the geographic distribution of the Gothic realms at that time. The Ostrogothic kingdom persisted until 553 under Teia, when Italy returned briefly to Byzantine control. This restoration of imperial rule was reversed by the conquest of the Lombards in 568. Shortly after Theodoric's death, the country was conquered by the Byzantine Empire in the Gothic War (535–554) that devastated and depopulated the peninsula. In 552, after their leader Totila was killed at the Battle of Taginae (552), effective Ostrogothic resistance ended, and the remaining Goths in Italy were assimilated by the Lombards, another Germanic tribe, who invaded Italy and founded the Kingdom of the Lombards in 567 AD. In the late 18th century, Gothic tribes who remained in the lands around the Black Sea, especially in Crimea - then known as Crimean Goths - were still mentioned as existing in the region and speaking a Crimean Gothic dialect, making them the last true Goths. The language is believed to have been spoken until as late as 1945. They are believed to have been assimilated by the Crimean Tartars. However, it was claimed that the Crimean Goths had survived to interbreed with German settlers in Crimea during the Third Reich and that German communities in Crimea constituted native peoples of that area. An Ostrogothic eagle-shaped fibula, 500 AD, Germanisches Nationalmuseum Nuremberg. The Gothic language is an extinct language, a branch of the Germanic languages that was spoken by the Goths. It is known primarily from the Codex Argenteus, a 6th Century copy of a 4th Century Bible translation, and is the only one of the East Germanic languages with a sizable corpus. All others, including Burgundian and Vandalic, are known, if at all, only from proper names that survived in historical accounts, and from loan-words in other languages like Spanish and French. A romantic depiction of Ulfilas converting the Goths to Arian Christianity. Gothic is the Germanic language with the earliest attestation. The oldest documents in Gothic date to the 4th century. The existence of such early-attested documents in Gothic makes it a language of considerable interest in comparative linguistics. The language was in decline by the mid-6th century, due in part to the military defeat of the Goths at the hands of the Franks, the elimination of the Goths in Italy, and geographic isolation (in Spain the Gothic language lost its last and probably already declining function as a church language when the Visigoths converted to Catholicism in 589). Archaeology shows that the Visigoths, unlike the Ostrogoths, were predominantly farmers. They sowed wheat, barley, rye, flax. They also raised pigs, poultry, and goats. Horses and donkeys were raised as working animals, and fed with hay. Sheep were raised for their wool, which they fashioned into clothing Archaeology indicates they were skilled potters and blacksmiths. When peace treaties were negotiated with the Romans, the Goths demanded free trade. Imports from Rome included wine, and cooking-oil. During the 370s, converted Goths were subject to the Gothic persecution of Christians by the remaining pagan authorities of the Thervingi people. 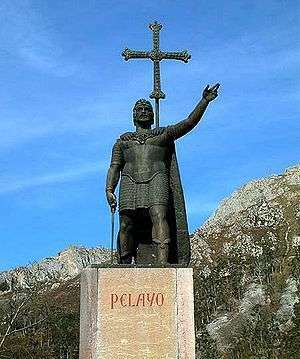 In Spain, the Visigothic nobleman Pelagius of Asturias who founded the Kingdom of Asturias and began the Reconquista at the Battle of Covadonga, is a national hero regarded as the country's first monarch. The language survived as a domestic language in the Iberian peninsula (modern Spain and Portugal) as late as the 8th Century, and Frankish author Walafrid Strabo wrote that it was still spoken in the lower Danube area and in that Crimean Gothic was spoken in isolated mountain regions in Crimea in the early 9th century. Gothic-seeming terms found in later (post-9th century) manuscripts may not belong to the same language. In Chile, Argentina and the Canary Islands, godo was an ethnic slur used against European Spaniards, who in the early colony period often felt superior to the people born locally (criollos). In Colombia the members of the Colombian Conservative Party were referred to as godos. The Spanish and Swedish claims of Gothic origins led to a clash at the Council of Basel in 1434. Before the assembled cardinals and delegations could engage in theological discussion, they had to decide how to sit during the proceedings. The delegations from the more prominent nations argued that they should sit closest to the Pope, and there were also disputes over who was to have the finest chairs and who was to have their chairs on mats. In some cases, they compromised so that some would have half a chair leg on the rim of a mat. In this conflict, Nicolaus Ragvaldi, bishop of the Diocese of Växjö, claimed that the Swedes were the descendants of the great Goths, and that the people of Västergötland (Westrogothia in Latin) were the Visigoths and the people of Östergötland (Ostrogothia in Latin) were the Ostrogoths. The Spanish delegation retorted that it was only the lazy and unenterprising Goths who had remained in Sweden, whereas the heroic Goths had left Sweden, invaded the Roman empire and settled in Spain. Pliny the Elder wrote that Pytheas, an explorer who visited Northern Europe in the 4th century BC., reported that the Gutones, a people of Germany, inhabit the shores of an estuary called Mentonomon (the Baltic Sea). The 6th Century Byzantine historian Procopius wrote that the Goths were tall and blond haired: For they all have white bodies and fair hair, and are tall and handsome to look upon. He noted that the Goths, Gepidae and Vandals were physically and culturally identical, suggesting a common origin. ↑ "Ostrogoth". Encyclopædia Britannica Online. Encyclopædia Britannica, Inc. Retrieved January 16, 2015. ↑ Waldman, Carl; Mason, Catherine (2006). Encyclopedia of European peoples. New York: Facts On File. p. 575. ISBN 978-0816049646. ↑ Hewitt, Winfred P. Lehmann ; with bibliography prepared under the direction of Helen-Jo J. (1986). A Gothic etymological dictionary. Leiden: E.J. Brill. pp. 163–164. ISBN 978-9004081765. ↑ Braune, W; Heidermanns, F (2004). Gotische Grammatik. Tübingen: Niemeyer. ↑ Dunlap, Herwig Wolfram ; translated by Thomas J. (1990). History of the Goths (New and completely rev. from the 2nd German ed., 1st pbk. print. ed.). Berkeley: University of California Press. pp. 16–56, 209–210. ISBN 978-0520069831. ↑ "Who Were the Ancient Goths?". Retrieved 2016-09-09. 1 2 Kaliff, Anders (2001). Gothic Connections. Contacts between eastern Scandinavia and the southern Baltic coast 1000 BC – 500 AD. Uppssala: OPIA. Retrieved 7 September 2016. ↑ Kessler, P L. "Kingdoms of the Germanic Tribes - Goths / Ostrogoths". www.historyfiles.co.uk. Retrieved 2016-09-09. ↑ Kokowski, Andrzej (1999), Archäologie der Goten (in German), ISBN 83-907341-8-4 . ↑ Dabrowski, J. (1989). Nordische Kreis un Kulturen Polnischer Gebiete. Die Bronzezeit im Ostseegebiet. p. 73. 1 2 "History of Europe: The Germans and Huns". Encyclopædia Britannica Online. Encyclopædia Britannica, Inc. Retrieved January 16, 2015. ↑ "Germany: Ancient History". Encyclopædia Britannica Online. Encyclopædia Britannica, Inc. Retrieved January 16, 2015. 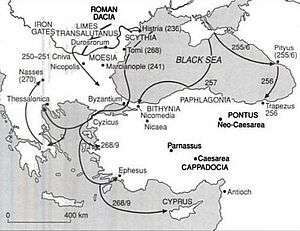 ↑ Arhenius, B, Connections between Scandinavia and the East Roman Empire in the Migration Period, pp. 119, 134 , in Alcock, Leslie (1990), From the Baltic to the Black Sea: Studies in Medieval Archaeology, London: Unwin Hyman, pp. 118–37 . ↑ "Goth". Collier's New Encyclopedia. 1921. ↑ "Goth". Encyclopædia Britannica Online. Encyclopædia Britannica, Inc. Retrieved January 16, 2015. ↑ "Ancient Rome: The Reign of Constantine". Encyclopædia Britannica Online. Encyclopædia Britannica, Inc. Retrieved 16 January 2015. ↑ Kulikowski 2006, p. 130. ↑ "Spain: The Christian states, 711–1035". Encyclopædia Britannica Online. Encyclopædia Britannica, Inc. Retrieved January 16, 2015. ↑ Gottfried Schramm, Altrusslands Anfang. Historische Schlüsse aus Namen, Wörtern und Texten zum 9. und 10. Jahrhundert, Freiburg i. Br. 2002, p. 54. ↑ Pohl, Walter. Strategies of Distinction: Construction of Ethnic Communities, 300–800 (Transformation of the Roman World. pp. 119–21. ISBN 90-04-10846-7. .
↑ "Visigothic Society". Magyar Elektonikus Könyvtár. ↑ Heather, Peter; Matthews, John (1991). The Goths in the fourth century (Repr. ed.). Liverpool: Liverpool Univ. Press. ISBN 978-0853234265. ↑ "The Visigoths' Peasant Economy". Magyar Elektronikus Könyvtár. Retrieved 17 September 2016. ↑ Pohl, Walter. Strategies of Distinction: Construction of Ethnic Communities, 300–800 (Transformation of the Roman World). pp. 124–6. ISBN 90-04-10846-7. .
↑ Söderberg, Werner. (1896). "Nicolaus Ragvaldis tal i Basel 1434", in Samlaren, pp. 187–95. ↑ Edward Gibbon judged Ammianus "an accurate and faithful guide, who composed the history of his own times without indulging the prejudices and passions which usually affect the mind of a contemporary." (Gibbon, Edward, Decline and Fall of the Roman Empire, Chapter 26.5). But he also condemned Ammianus for lack of literary flair: "The coarse and undistinguishing pencil of Ammianus has delineated his bloody figures with tedious and disgusting accuracy." (Gibbon, Chapter 25.) Ernst Stein praised Ammianus as "the greatest literary genius that the world produced between Tacitus and Dante" (E. Stein, Geschichte des spätrömischen Reiches, Vienna 1928). ↑ "However, the seed and origin of all the ruin and various disasters that the wrath of Mars aroused ... we have found to be (the invasions of the Huns)", Marcellinus, Ammianus; tr. John Rolfe (1922), "2", Latin text and English translation, XXXI, Loeb edition . ↑ Craig H. Caldwell: Contesting late Roman Illyricum. Invasions and transformations in the Danubian-Balkan provinces. A dissertation presented to the Pricenton University in candidacy for the degree of doctor in philosophy. Quote: "The Life Of Probus like much of the rest of Historia Augusta is a more trustworthy source for its fourth-century audience then for its third-century subject"; Robert J. Edgeworthl (1992): More Fiction in the "Epitome". Steiner. Quote: "For a century it has been established to general if not universal satisfaction, that biographies in Historia Augusta, especially after Caracalla, are a tissue of fiction and fabrication layered onto a thin thread of historical fact"; this view originates with Hermann Dessau. ↑ The Historia Augusta mentions Scythians, Greuthungi, Tervingi, Gepids, Peucini, Celts and Heruli. Zosimus names Scythians, Heruli, Peucini and Goths. ↑ Contractus, Hermannus, Chronicon , quoting of Caesarea, Eusebius, Vita Constantini, p. 263 : "Macedonia, Graecia, Pontus, Asia et aliae provinciae depopulantur per Gothos". ↑ Jordanes; Charles C. Mierow, Translator (1997). "The Origins and Deeds of the Goths". Calgary: J. Vanderspoel, Department of Greek, Latin and Ancient History, University of Calgary. pp. 24–96. Retrieved October 26, 2013. ↑ Beck, Heinrich; Geuenich, Dieter; Hoops, Johannes; Jankuhn, Herbert; Steuer, Heiko (2004), Reallexikon der Germanischen Altertumskunde (in German) (2nd ed. ), Berlin: Walter de Gruyter, pp. 452ff, ISBN 978-3-11-017733-6 . ↑ Orosius (417). The Anglo-Saxon Version, from the Historian Orosius (Alfred the Great ed.). London: Printed by W. Bowyer and J. Nichols and sold by S. Baker. Retrieved 28 March 2016. ↑ Bostock, John. "Pliny the Elder, The Natural History". ↑ Tacitus, Cornelius (2008-11-14). The Works of Tacitus: The Oxford Translation, Revised, with Notes, Volume II. BiblioLife. ISBN 9780559473357. ↑ "The Goths". Retrieved 2016-09-09. Andersson, Thorsten (1996). "Göter, goter, gutar". Namn och Bygd (in Swedish). Uppsala. 84: 5–21. Bell-Fialkoff, Andrew, Editor (2000). The Role of Migration in the History of the Eurasian Steppe: Sedentary Civilization vs. "Barbarian" and Nomad. New York: St. Martin's Press. ISBN 0-312-21207-0. Bowman, Alan; Garnsey, Peter; Cameron, Averil (September 8, 2005). The Cambridge Ancient History: Volume 12, The Crisis of Empire, AD 193-337. Cambridge University Press. ISBN 0521301998. Retrieved January 17, 2015. Bradley, Henry (1888). The Goths: From the Earliest Times to the End of the Gothic Dominion in Spain. London: T. Fisher Unwin. ISBN 1-4179-7084-7. Downloadable Google Books. Cameron, Alan; Long, Jacqueline; Sherry, Lee (20 June 2013). Barbarians and Politics at the Court of Arcadius. University of California Press. ISBN 0520065506. Retrieved January 17, 2015. Kulokowski, Michael (October 30, 2006). Rome's Gothic Wars: From the Third Century to Alaric. Cambridge University Press. ISBN 1139458094. Retrieved January 17, 2015. Moorhead, Sam; Stuttard, David (2010). AD410: The Year that Shook Rome. Getty Publications. ISBN 1606060244. Retrieved January 17, 2015. Tucker, Spencer (December 23, 2009). A Global Chronology of Conflict: From the Ancient World to the Modern Middle East. ABC-CLIO. ISBN 1851096728. Retrieved January 17, 2015. Wolfram, Herwig (1997). 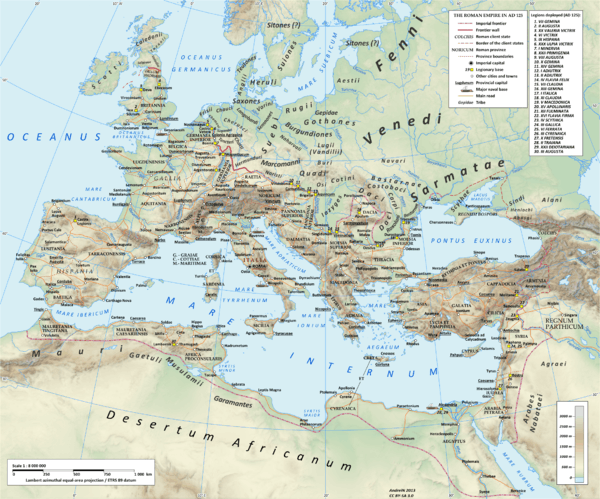 The Roman Empire and Its Germanic Peoples. University of California Press. ISBN 0520085116. Retrieved 1 January 2015. Wikimedia Commons has media related to Goths. Wikisource has the text of the 1911 Encyclopædia Britannica article Goths.